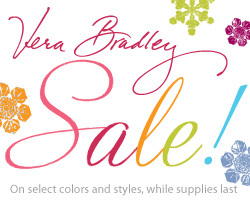 Retiring Vera Bradley Sale Begins Sept 1st! ‎30% off new retiring Vera Bradley goes on sale tomorrow, September 1st. Colors are Barcelona, Slate Blooms, Hello Dahlia and Twirly Birds Navy. Retiring styles include the Opera Wallet, Angle Tote and Hobo. Shop early for the best selection and favorite bag styles! Help us name our new Outlet Center and if we pick your name suggestion, you win a $50 gift certificate to use at either Ivy Ridge location. As many of you know our Elkin shop is huge, so we are putting in a large area for SALE ITEMS. We would like a special name for it. A name that is unique, refers in some way to Ivy Ridge if possible, appeals to women, and lets someone know it is a sale area. Simply, post it on our Facebook page at www.facebook.com/ivyridgetraditions if you are a Facebook member or email your idea to angela@ivyridge.com.